Omega is a supplier of high quality alumina components. These materials offer excellent wear resistance, electrical and thermal insulation characteristics as well as high temperature strength. They are also exceptional in abrasive and corrosive environments. 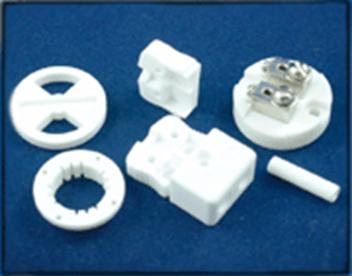 Parts are produced by extrusion, slip casting and dry pressing methods. We offer a wide range of shapes, sizes and purity levels to meet your requirements. We handle small prototype to large blanket order quantities. See our chart for the physical properties of these materials. Custom purities are also available. Applications for our alumina products include the semiconductor, aerospace, automotive, industrial, and other markets. We have over 30 years of experience in the alumina ceramics field.